USC Norris > About USC Norris > Leadership > Alan S. Wayne, M.D. If you are a patient, please contact Keck Medical Center of USC at 800-USC-CARE. Alan S. Wayne, M.D., is the Associate Director for Pediatric Oncology, Professor of Pediatrics and Medicine at the Keck School of Medicine of USC, the Director of the Children's Center for Cancer & Blood Diseases at Children's Hospital Los Angeles (CHLA), and the Head of the Division of Hematology, Oncology and Blood & Marrow Transplantation in the Department of Pediatrics. 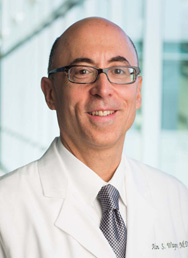 In these roles, he oversees all research, treatment, prevention and education programs in hematology, oncology and hematopoietic stem cell transplantation at NCCC and CHLA. Prior to joining USC in 2013, Dr. Wayne served as senior clinician and clinical director of the Pediatric Oncology Branch, head of the Hematologic Diseases section and deputy director for Medical Affairs of the National Cancer Institute (NCI) at the National Institutes of Health. Board-certified in pediatric hematology-oncology, Dr. Wayne attended medical school at Northwestern University and served his internship, residency and chief residency at Boston Children's Hospital prior to completing his pediatric hematology-oncology fellowship at the Children's Hospital and the Dana-Farber Cancer Institute. Dr. Wayne's primary research efforts are directed towards the development of new treatment approaches for leukemias and lymphomas, with a primary focus on relapsed/refractory acute lymphoblastic leukemia (ALL). He develops and conducts collaborative laboratory, translational, and clinical investigations, with a focus on targeted, immune-based and cellular therapies, investigator-initiated clinical trials, and industry-sponsored studies. He was responsible for the bench-to-bedside development of anti-CD22 recombinant immunotoxin for the treatment of ALL and has an ongoing lead role in the development of genetically modified T-cells as a novel therapy for ALL. Dr. Wayne serves as the Medical Director of the Therapeutic Advances in Childhood Leukemia/Lymphoma (TACL) Consortium, which is a multinational clinical trials group that conducts Phase I and II trials. The USC Norris Comprehensive Cancer Center, located in Los Angeles on USC's Health Sciences campus, is a major regional and national resource for cancer research, treatment, prevention and education. It is one of the nation's 48 NCI-designated Comprehensive Cancer Centers and one of the original eight centers of its kind established in 1973. The Center is a leader in cancer research, with more than 200 members investigating the complex origins and progression of cancer, developing prevention strategies and searching for cures.